Texas has a vibrant spring with a multitude of flowers beginning with bluebonnets and firewheels and daisies and buttercups. 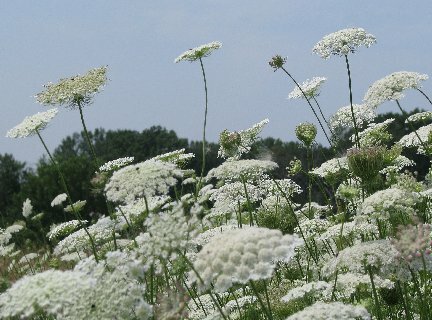 But Wisconsin is equally lush with Queen Anne lace and chicory and lilies. They bloom in perfusion along the roadways and the sides of cornfields. Days are long and the sunsets form a gorgeous backdrop for cornfields and fields of alfalfa and barns with silos. The temperature drops into the mid fifties for perfect sleeping and into the eighties for fabulous do anything you want. That anything for a couple of weeks in August has been digging new basements for the additions to the farmhouse. Glen cut doors into the existing basement using a cement saw and a diamond blade. Both basement additions have been poured and approved by my brother who is my general contractor. I’m excited. The farmhouse had fallen into disrepair and was a source of sadness for us all. With the planned renovations it will be fresh and a delight.